"They’ve [the Park Church Co-op] just launched an official campaign that aims to both increase donations and congregation size." Read the full article here! "This queen got kids in the learning spirit! 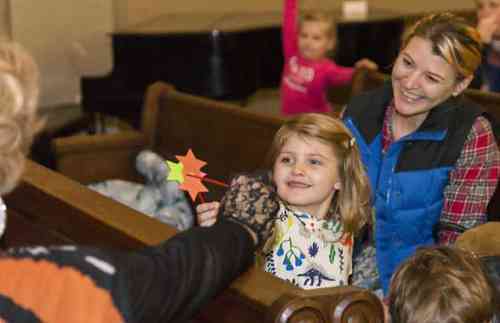 A local drag queen took to the altar of a Greenpoint church on Sunday to read stories to a crowd of youngsters, defying gender and religious norms to remind the kids that they can be anything they want when they grow up." Read the full article here! "In order to keep hosting concerts, events, and providing other services (like after-school programs for kids), the church needs your help. They’re looking to raise $50,000, and you can help them with a one-time or monthly tax deductible donation." Read the full article here! Kienzle discusses the rebranding of the once Lutheran Church and its inclusitivioty of all beliefs, spiritual and non-spiritual. "Greenpointers sat down with Pastor Amy to get the scoop about all the exciting programs her church is offering to the community these days." Read the full article here! "Gone are the days where the secular world and religion could not exist in the same space. In the community of Greenpoint, Brooklyn lies a Co-Op, once a Lutheran Church. 'The vision for the co-op is to be able to serve our neighbors, which is a command that Jesus gave for the church', Pastor Amy said. By opening the church to everyone, regardless of spiritual beliefs, Pastor Amy is able to connect with members of the community on a more personal level and meet the needs of the neighborhood. Read the full article here! An international Discussion Panel opening to intersectional feminism while debating place of feminism in traditional sacred spaces. Watch the whole panel on the right!